Me, sporting my new black and white collar. Note the look of happiness on my face. Oliver here. I’d like to share my “battle of the collar” with you. The humans have a rule; every member of The Tribe of Five must wear a collar with our names and the human’s phone number. Even though we are inside kitties, there has been the odd occasion over the years when one of us has slipped through someone’s legs and shot out the door to explore the garden or the neighborhood, hence the reason for the identification on the collars. Oh, and each collar has a bell because when there are five felines in the household who aren’t well-behaved all of the time, the humans are able to identify who is walking around, racing up the stairs, or jumping off the counter by the sound of our bells. I lost my first green collar quickly. The humans searched the house but I’d hidden it so well they gave up. A second collar was ordered. I pulled on that one so much, I managed to break the plastic buckle rendering the thing useless. The female human thought she’d try a new tactic. She went shopping and bought yet another new collar. She declared it perfect for me and told me over and over how “dapper” I looked in the black and white restraint, and how well it matched my luxurious coat. Then she had a small tag made with my name on the front and the human’s cell numbers on the back. This was attached to the collar with the bell. So, it’s not bad enough that I’m forced to wear this restraint now; I’m forced to suffer further distress with a tag that clinks against the attached bell. Every step I make, I hear, “tinkle, tinkle, clink, clink”. It is maddening. Alberto heard the “song of my collar” immediately, ran over to me and promptly slapped my tag and bell back and forth, enjoying the new “toy”. I was not amused. I refused to turn around so the female human was forced to photograph the newest constraint this way. I admit it did take a little more time to figure out how to extricate myself from this contraption but I managed- five times. The first four times, the humans successfully located my hiding place for the restraint and attach it to me. The fifth time I hid it so far away they’re still looking for it. Sadly, the female human found my very first collar and had the temerity to make me wear it this morning before she left for work. I have an entire day to get the thing off of me and bury it in a place she’ll never look. 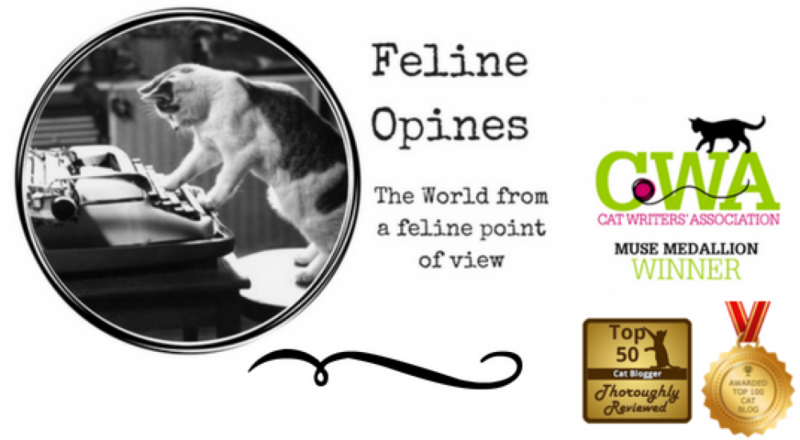 I call all my collar-despising feline friends to unite! Tell me your terrible collar tales and let’s figure out how to put an end to this barbaric practice! This entry was posted in adopting kittens, cat behavior, Cat blogs, cat collars, cats and tagged cat collars, cats dont like collars, cats removing collars by Feline Opines. Bookmark the permalink. You are very clever, but you should wear it for your safety in case you ever get outside. Pingback: Walk Through The Web Wednesday 1/10 - Baptize A Cat?